Just north of Port Douglas and Mossman, Gunnadoo is far enough away to enjoy spectacular peace and quiet, but close enough to everything you could wish for your holiday. 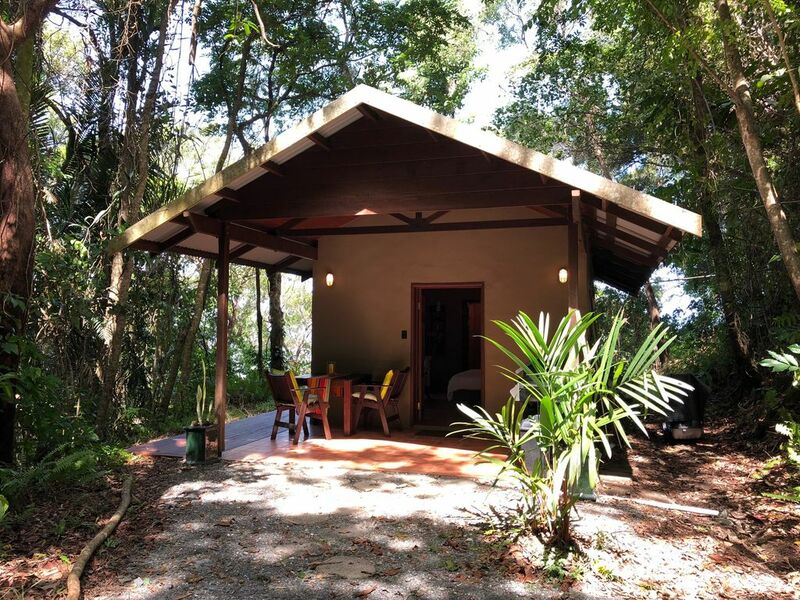 Located across the road from Rocky Point Beach, this private cabin is set in the rainforest, self contained with views over the Coral Sea and Low Isle. The property borders the Daintree National Park and Cape Tribulation is just up the road, perfect for a day trip or two of exploring the world’s oldest Rainforest. Great Barrier Reef cruises depart from Port Douglas, a 25 min. drive south as well as from Cape Tribulation. The cabin is perfect for 2 people and offers a Queen Bed, ensuite bathroom, fan & air conditioning, wi-fi, smart TV, tea & coffee making as well as a state of the art outdoor BBQ kitchen. The highlight of this absolutly private hut is a deck with Jacuzzi overlooking the coral sea and Low Isle! The Maui luxury hydrotherapy spa features 2 recliners facing the ocean and a total of 34 massaging jets! Your outdoor kitchen is equipped with a Ziegler & Brown Turbo BBQ including side burner and sink. Inside the cabin you have a large fridge, microwave, tea & coffee making and a toaster. After we managed the Pink Flamingo resort in Port Douglas for over 8 years we took a little break last year and bought this amazing property at Rocky Point, north of Port Douglas. The main house is an asian inspired treehouse where we offer 2 rooms with ensuites to guests and we have just finished renovating the holiday cabin on our property which is totally private, self contained, set in the rainforest with ocean views. We love the tourism industry and meeting interesting people from all around the world and all walks of life! We love travelling ourselves and hearing about other peoples inspiring adventures! Our large property is situated next to the Daintree National Park with Ocean Views. Recently we renovated the holiday hut, located in total privacy away from the main house. No neighbours just you, the rainforest and ocean! The Hut sleeps 2 people and the main house can accommodate 4 people in 2 guest rooms with ensuite and the house is shared with the hosts. Your privacy is guaranteed with no neighbours in sight, just the rainforest and ocean! Rest, relax, recharge but adventure is not too far away! What an amazing place to stay! We so enjoyed our 3 nights here. It’s so well thought out and has everything you need to provide a total get away from it all. Really clean and comfortable. The amazing outside kitchen and hot tub are really fantastic. We also managed to walk down to the beach for sunrise which was awesome, then back for fresh coffee and breakfast cooked on the BBQ. Great memories. Thanks Gigi and Andrea! Mossman Township is just a 10 min. drive from us and features a large supermarket, cafes and restaurants as well as Saturday local markets.